Who knew Camberwell was such a melting pot of global culture. Today's visit was inspired by a write up in Gin and Crumpets and an endorsement by none other than Jay Rayner, Observer food critic (and my personal food hero). 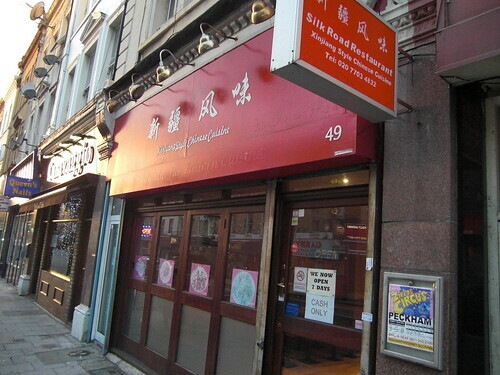 Silk Road is a Chinese restaurant located in the heart of Camberwell, but it probably isn't like most Chinese restaurant's that you may have visited before. 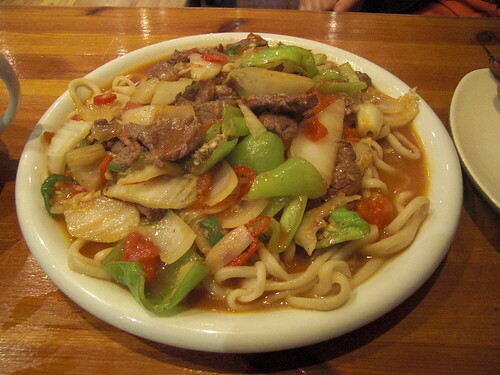 Serving the cuisine of Xinjiang, a northern province of China bordering Mongolia and Kazakhstan, it's residents are mostly Muslim and the menu is dominated by noodles and broths with a spicy kick, with a few pork dishes to keep the locals happy. I have walked past this place many times and never thought to venture in. Unassuming in appearance, it has endured various transformations over the years but always with a simple bright communal dining space. So, it was about time I tried it. Lamb Skewers - The best lamb (in my eyes) comes from Tayyabs in the form of their charcoal spiced lamb chops. This may seem like quite a statement, but if you haven't been before, go and give them a go yourself and make your own opinion. When I can't go to Tayyabs for my lamb fix, I'm going to start coming here. 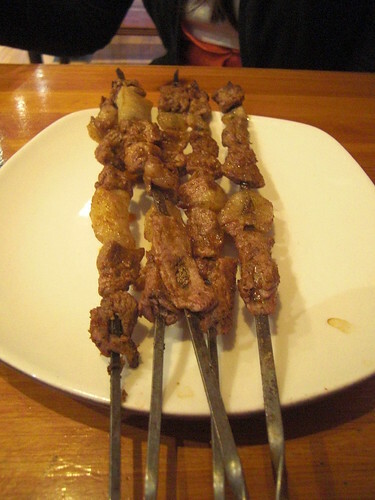 Skewers of tender spiced lamb interspersed with nuggets of lamb fat. Make sure you eat these when still hot, otherwise the tender chunks of fat turn into unappetising rubbery grease balls. Beef and Onion fried dumplings - 10 of these for £3? Seriously? 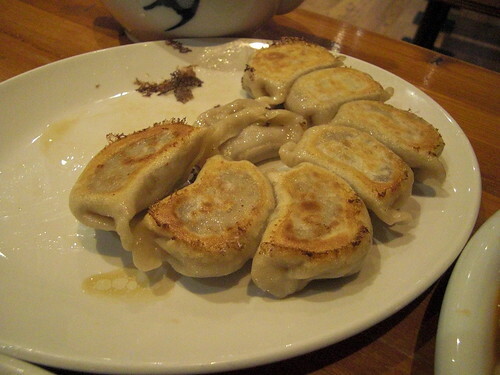 Steamed and then fried on one side, nice dumplings, but insane value. Special Lamb Noodles - Not exactly sure what makes these qualify as special but the homemade noodles were thick and immersed in a tomato based sauce, packed with greens and steeped in chilli. Small slices of tender lamb turned a good dish into a great dish. A good hearty meal with a slurp! 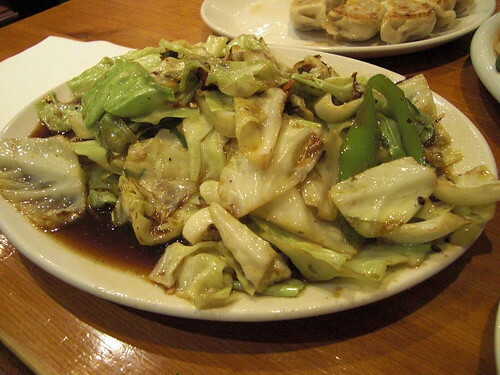 Home style Chinese greens - After all that meat, we needed some sort of veg to balance it out. Simple stir fried greens in soy and garlic. Simple and actually very good. The greens had been cooked quickly so it had plenty of bite but long enough so it retained some of the flavour of the sauce. Silk Road, what a find. Simple, tasty food, served at an unbelievable price. I think you would struggle to spend more than ten pounds a head. Well worth a trip down to Camberwell, but I secretly hope you don't bother. Its a great neighbourhood restaurant and it would be lovely if it stayed that way. We've really got to stop telling people at Silk Road - it'll be packed out every night and we'll never get a look in. Food looks great! Managed to go to a Uighur restaurant in Beijing and though their lamb kebabs were better than Silk Road, the big plate chicken is definitely better in Camberwell. Silk Road is best. Aha! Been meaning to go here for ages and obviously it is very close to me. Oh how I wish this place had been there when I still worked at King's! I can't believe how cheap it is too - bargainous!! 10 dumplings for £3 - unbelievable - they're not that much cheaper in Beijing. I used to eat a lot of Xinjiang food in Beijing. The lamb was to die for (you would love it!). That is really cheap for 10 dumplings by the way, and they look massive. Thanks for posting this - just came across your blog today and read all the Chinese food reviews. I have been looking for a proper dim sum place that, well, frankly, just tastes good. Tried Chinatown to Phoenix Palace to Yauatcha, but at the end of the day - must beat what we got in Toronto. I'm going to try Silk Road - looking for a good dumpling place as well - I agree - the one in Chinatown - is just a bit lacking. Thank you. @ Anon - Thanks for your kind words. I would be wary that Silk Road isn't really a dim sum place (although it does sell some good dumplings). 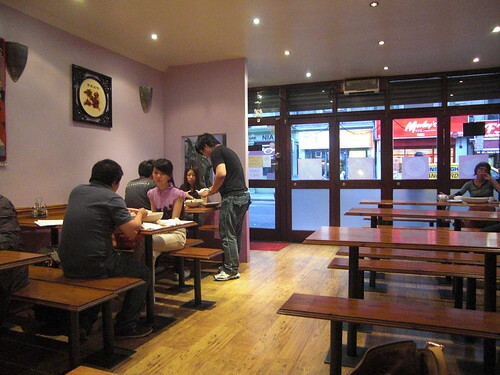 I would personally head to Dragon Castle in Elephant and Castle for great dim sum. We're familiar with Uighur culture, and was looking forward to Silk Road, based on your reviews. So far we've been there twice, and been very disappointed with the food. Everything had dried chili pepper dumped on it. What little cumin flavour the lamb had was totally drowned out by the dried chili pepper. And the noodles you liked, were totally tasteless, except for the heaps of dried chili pepper dumped on it. We eat hot food, but we couldnt stomach this.